Stumbling across the January 2015 issue of Practical Boat Owner, my eye was drawn to an article by Dave Berry. Fitting solar panels: There are many types of solar panels and regulators, but which might constitute the most effective set-up for your boat? As I hope to install some more solar this season I was intrigued, as it was clear Dave had gone through the same thought processes in fitting solar to his own boat, as I have been with mine. 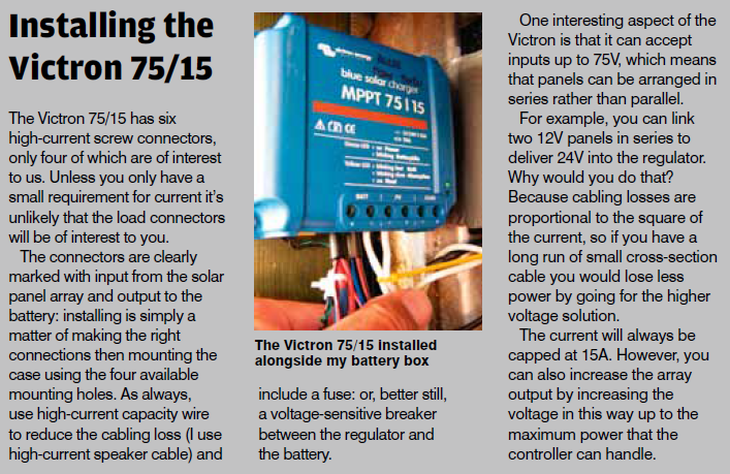 Also it was great to see the Victron BlueSolar MPPT 75/15 showing benefits over a Morningstar SunSaver 20 PWM Solar Controller, as you can see in the headline image above. To some extent the fact that the Victron MPPT came out better than the Morningstar PWM solar charge controller, was no surprise. However it’s good to see confirmation of your own research verified in a magazine. For a summary of the benefits of MPPT v PWM, which I culled from Reinout Vader’s excellent whitepaper on the subject, see the blog post: Which solar charge controller: PWM or MPPT? The complete white paper puts matters in an even fuller perspective. 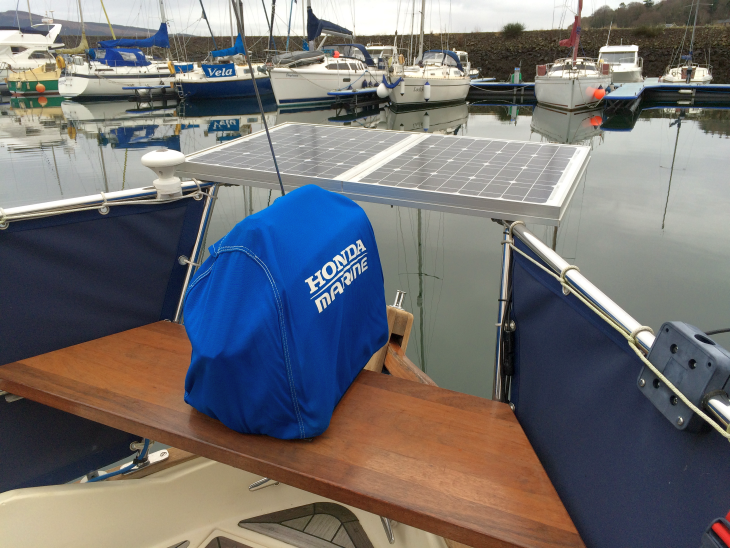 For my own boat I used a BlueSolar MPPT 75/15 and 2 x 30 Watt mono-crystalline panels in series so I have the correct minimum panel voltage to charge my AGM 24V battery string. As you can see below my boat is a double-ender, so there is little space for more or indeed a tilting arrangement. Ignore the generator for now as that is a blog for another day, about the magic of a MultiPlus. That’s not much solar I hear you say. Indeed it is not, yet the most I can sensibly add to my 8m yacht is another 100 Watts. In that case it would be very nice to have some flexible high efficiency cells at around 22.5% . More efficiency equals less area when comparing cells of equal output. Note I said cells not panels. Once I got over the price (around 4 times more than a good rigid glass fronted panel of the same rating) I started looking at actual module sizes, ratings and output for the available footprint. Whilst there is no doubt that an efficient panel is a good panel, I’m in the price sensitive league of boating, so I decided to calculate a range of panels v cost v output per square metre. It yielded some surprising results. I wanted to see if the high efficiency boat specific flexible panels represented good value for money, by reducing the installed area and maximizing the output. Comparing one of the 50W high efficiency flexible panels with a Victron SPM51-12 50 watt rigid panel, I was shocked to discover the rating was 155.42 watts per square metre vs 143.55 watts for the Victron panel. Quite frankly a 12 watt gain per square metre, is no excuse to spend 4 times the money! The only caveat to that is that panels, subject to their cell or module efficiency, cell area, glass area and module area, can vary per square metre of module output from 120 watts to 180 watts. It is worth comparing these factors (along with module shape) and weighing them against the cost per watt to see what is best for a given module or modules footprint, that will fit your boat. This way you choose the optimum for your particular boat, especially if you mount them in the least shaded area. If, like me you are a seasonal, non live-aboard sailor who sails in the months of May, June, July, August, then it is often not worth the extra weight, windage and complication of tilting panels. I live at 55 degrees latitude so the optimum for those months, with panels facing south would be a 40 degree elevation/50 degree tilt. As the boat changes direction a lot sailing around the islands off the west coast of Scotland (rather than being on a long tack for hours on end) it is simply easier to install flat panels and live with the 10% loss in solar harvest for my location. If you are fitting solar panels to your own boat, I hope that helps cover some of the considerations, that others have found too. Dave’s complete article, which prompted this blog is here. Further supporting guidance by him to his article ‘Fitting solar panels’ is here. Credits: Thanks to Dave Berry and Practical Boat Owner for permission to publish the results from their January 2015 magazine article and to Johannes Boonstra for supporting technical information. VRM Portal update: Do we speak your language?